The Leupold DeltaPoint Reflex Sight Matte 3.5 MOA Dot ushers in the next generation of illuminated reflex sights with progressive technology that speeds target acquisition and keeps shooters of all skill levels focused and right on the mark. The DeltaPoint Reflex Sight by Leupold can be used with nearly any firearm, from handguns to shotguns to AR-style rifles. The Reflex Sight 's applications range from plinking to hunting to competitive shooting, as well as home defense, law enforcement and military. The Leupold DeltaPoint Reflex Sight 's compact size allows mounting of the sight in conjunction with a primary riflescope for use when adjusting fire from distant to short-range targets, or dealing with changing environments in a single tactical encounter. 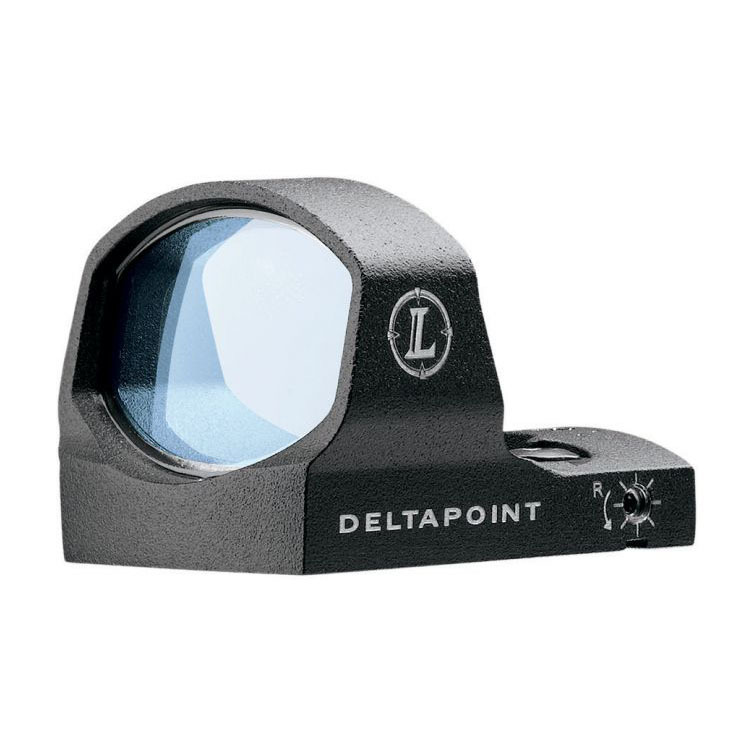 Leupold DeltaPoint Reflex Sights Matte 3.5MOA come in a kit which includes numerous mounting options, saving the additional expense of purchasing separate mounts that may cost hundreds of dollars more. A special plate system aligns the mount with the gun, ensuring a good fit. Each kit has plates for 10 of the most popular handgun applications, with compatibility for up to 40 different handgun models. There is also a cross-slot mount for easy coupling with Picatinny Weaver-style rails and bases. Key features that make Leupold Delta Point Reflex Sight a truly unique high-performance shooting optic include an innovative aspheric lens, motion activation, auto-brightness sensor, locking elevation and windage adjustment system, and an ultralight rugged magnesium housing. Exclusive to this Leupold Reflex Sight are two screws that lock in windage and elevation adjustments, preventing the reticle from wandering under heavy recoil or extended shooting periods. A generous 120-MOA of adjustment range for both windage and elevation makes zero easy to change and maintain, allowing the shooter to dial in the target with precise accuracy. Adjustment markings are ¼-inch MOA with an adjustment tool included with the sight. With these features of the Leupold DeltaPoint Reflex Sight Matte 3.5 MOA Dot, Leupold has launched a next-generation optic that is extremely versatile, intuitive and rugged, while providing the ease and precise accuracy of a red dot sight. Aspheric lens is set in a wide housing, increasing the usable field of view by up to 56 percent (depending on firearm) as compared to other reflex sights. With edge-blackened treatments, the lens produces an exceptionally bright, sharp and clear image across the visual field. Optics treated with DiamondCoat for high resistance to abrasion and scratches. Proprietary motion sensor detects even the slightest movement and instantly activates the illumination, ensuring that DeltaPoint is ready when the time comes for quick action. Auto-brightness sensor continuously samples lighting conditions and adjusts to changes, providing optimal reticle intensity that allows the shooter to quickly place the reticle on the target. Auto-off feature shuts down the reticle after an inactive period, that delivers up to twice the battery life of other reflex sights. Lens housing is made from lightweight magnesium tested to withstand up to 3,500 Gs of impact. DeltaPoint is waterproof and shock proof, and covered by the Leupold Full Lifetime Guarantee. 3.5 MOA Dot reticle offers a reliable aiming point familiar to many shooters. Low-profile design that keeps the sight on target, yet unobtrusive to the shooter. Precision locating pins allow easy removal and installation of the mounting brackets while maintaining point of impact.